The focus of this year’s LearningSCAPES national conference was “Global Innovations in the Learning Environment,” and fittingly, there was representation from Canada, the UK and even participants from down-under in Australia and New Zealand. The A4LE conference was held in Atlanta, Ga. where for four days educators, design professionals and suppliers gathered for a conversation around the future of education. There was plenty to be learned, but throughout the conference I saw four distinct themes emerge: innovative campus design, design thinking, data-driven design and biophilic design. With the spread of automation, robotics and low overseas labor costs, the education and training of tomorrow’s workforce is increasingly garnering more attention. There is a growing concern that we need to rethink how we prepare students to succeed in the face of an uncertain future. 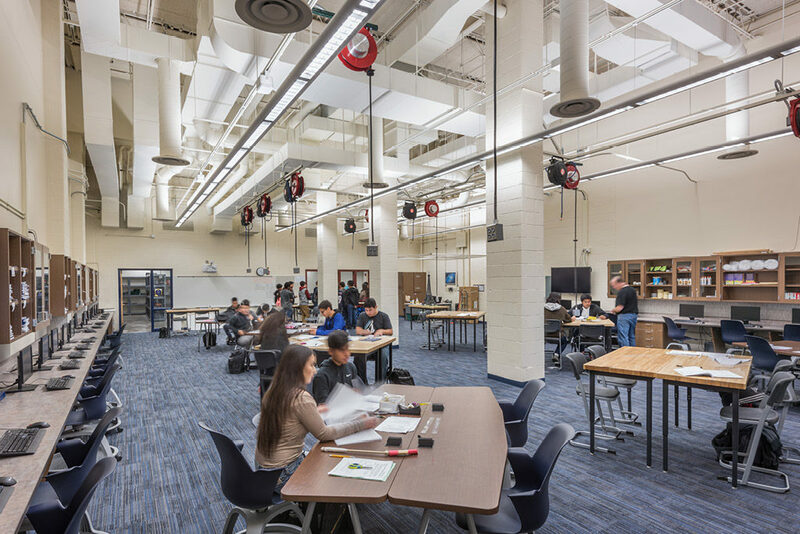 Next generation schools are being designed to accommodate the shifting needs of education by providing spaces that will successfully prepare and equip students for careers that are still being invented. The innovative campus aims to prepare all students for a future that will require high-tech and high-touch skills, in whatever direction their career paths take them. An innovative campus is made up of dynamic learning environments that encourage collaboration in college-like settings, and learning and training environments that mimic real-world counterparts. 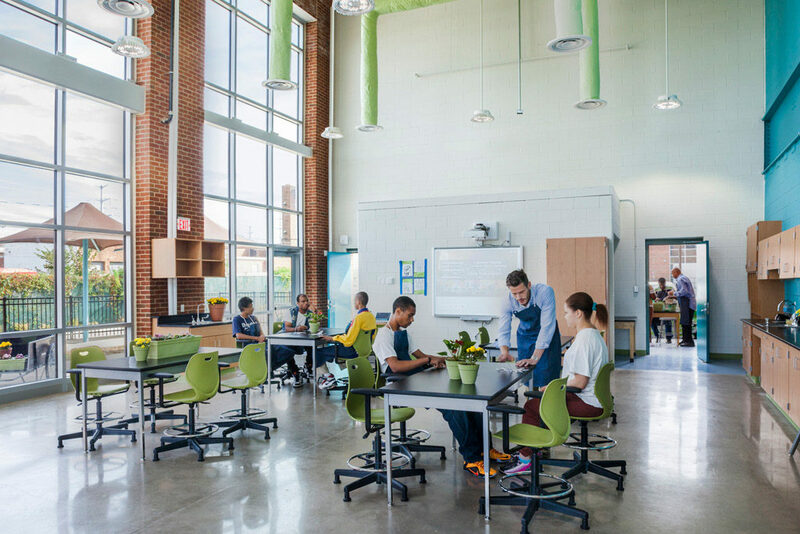 Flexible spaces and integrated technologies in each setting provide future-ready schools that will adapt to changing curriculum and teaching methods. State-of-the-art pathway centers support career exploration and collaboration, allowing students to delve into real-world training and discovery. The challenge going forward is to find the right balance of fixed and flexible spaces in current design to allow schools the widest range of possible futures. Pathway centers allow students to explore careers and develop future-ready skills. This phrase has spread like wildfire throughout the educational community, and it came up in almost every LearningSCAPES presentation I attended this year. Originally a term coined by IDEO and Stanford’s d.school in the early 2000s, design thinking represents a process for creative problem solving focused on human-centered techniques. More recently the process has been applied by educators, school designers and community groups as a way to increase student achievement and develop successful learning environments. Design thinking can be used in almost any context, but for school districts it’s being applied in visioning workshops. An effective process is to use design thinking strategies to define what success means to your district, develop goals to get there and determine how your spaces will support these goals. Then, follow through. Whether you’re using design thinking to solve an individual problem or to better your district as a whole, it can be a valuable strategy to help jumpstart your creative process and find innovative solutions. It’s easy for designers to claim their buildings will perform by increasing student engagement or being exceptionally energy-efficient, but it is another thing to prove it. Research in the form of post-occupancy evaluations can serve to validate the effectiveness of design and inform designers if their facilities are being used as intended. Post-occupancy data completes the cycle—by learning from design it furthers the future of design. To continue to progress, designers need to be challenged by real-world data to justify design decisions and their effect on students. This year’s LearningSCAPES presenters recommend hiring a third-party researcher. While this isn’t cheap, their testimonies spoke to its value. 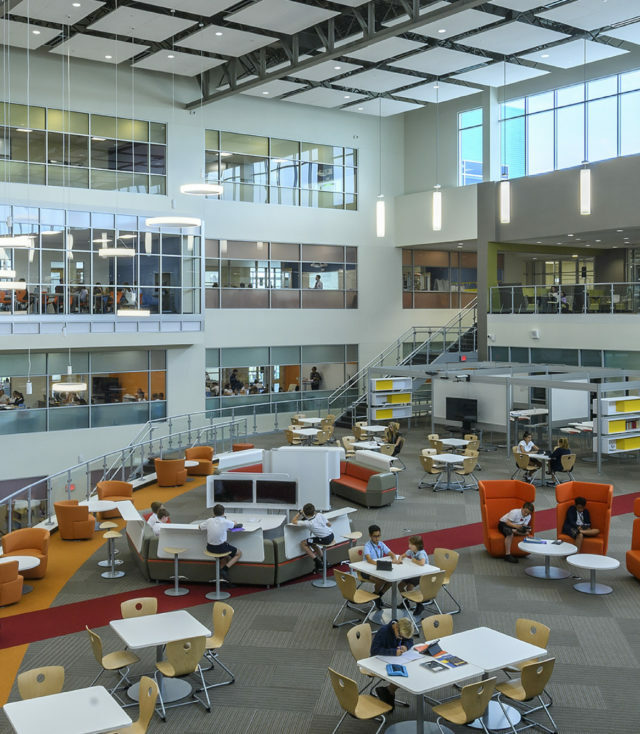 In one example, a firm brought in a researcher to evaluate only the Learning Commons of a building, and this targeted approach allowed them to look specifically at learning outcomes of certain design features. Research like this can sometimes be seen as an unnecessary expense, but the data can be used to improve designs and increase learning. Instead of viewing research as an additional cost to an already completed project, designers should view it as an investment in the future. The last reoccurring theme I observed at this year’s conference was biophilic design. Sometimes referred to simply as “nature-inspired architecture,” biophilic design uses design strategies that contribute to human health, wellness and productivity. When done well, it enhances the learning community and underscores the unique connections to a specific place. And it is more than just a fad. The healthcare industry has been implementing biophilic principles since the 1990s with research that patient recovery time is improved when connected to nature and nature-inspired designs. In designing for learning, a body of scientific evidence is growing in support of biophilic design, highlighting the benefits for mental focus and healthy brain development. It has also shown to lower stress levels, leading to fewer disciplinary problems in students by inspiring feelings of safety. And, more obviously, restoring connections to the outside world can spark curiosity and exploration! Biophilic design contributes to mental health and student wellness. LearningSCAPES 2017 was an inspiring event. Sharing ideas, information and solutions with individuals from all over the world who are passionate about school design is a humbling experience, and I left with new inspirations for my future designs. As educators, vendors and designers, it is vital we all continue to learn from each other to improve education worldwide.